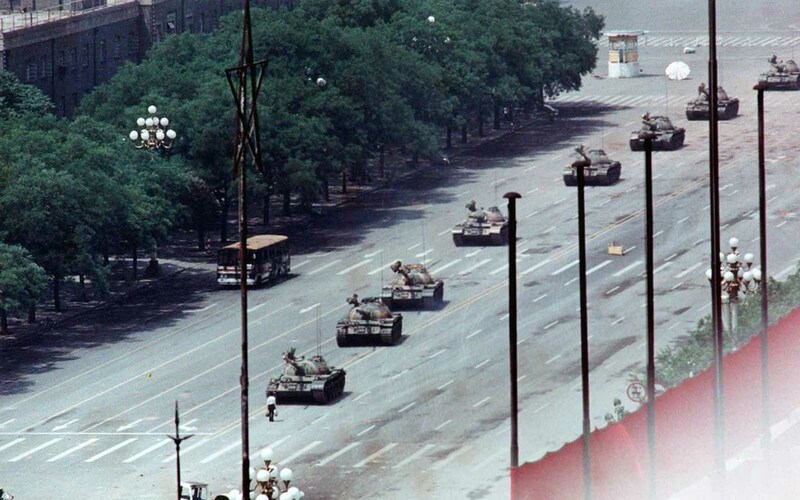 A Chinese man stands alone to block a line of tanks heading east on Beijing’s Cangan Boulevard in Tiananmen Square, on on June 5, 1989. The man, calling for an end to violence and bloodshed against pro-democracy demonstrators, was pulled away by bystanders, and the tanks continued on their way. The Tiananmen Square protests of 1989 culminating in the Tiananmen Square Massacre were a series of demonstrations in and near Tiananmen Square in the People’s Republic of China (PRC) between April 15 and June 4, 1989. They were mainly led by Beijing students and intellectuals. The protests occurred in a year that saw the collapse of a number of communist governments around the world. By the spring of 1989 there was growing sentiment among university students and others in China for political and economic reform. The country had experienced a decade of remarkable economic growth and liberalization, and many Chinese had been exposed to foreign ideas and standards of living. In addition, although the economic advances in China had brought new prosperity to many citizens, it was accompanied by price inflation and opportunities for corruption by government officials. 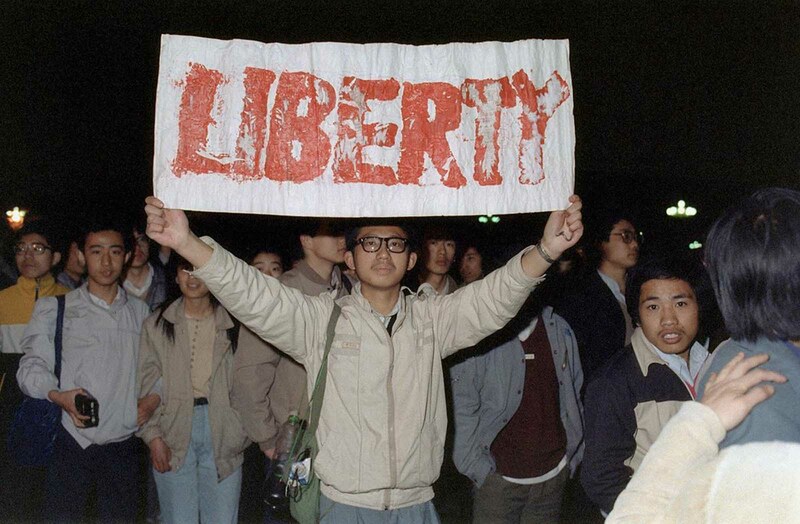 A student displays a banner with one of the slogans chanted by the crowd of some 200,000 pouring into Tiananmen Square, on April 22, 1989 in Beijing. They were attempting to participate in the funeral ceremony of former Chinese Communist Party leader and liberal reformer Hu Yaobang, during an unauthorized demonstration to mourn his death. His death in April triggered an unprecedented wave of pro-democracy demonstrations. 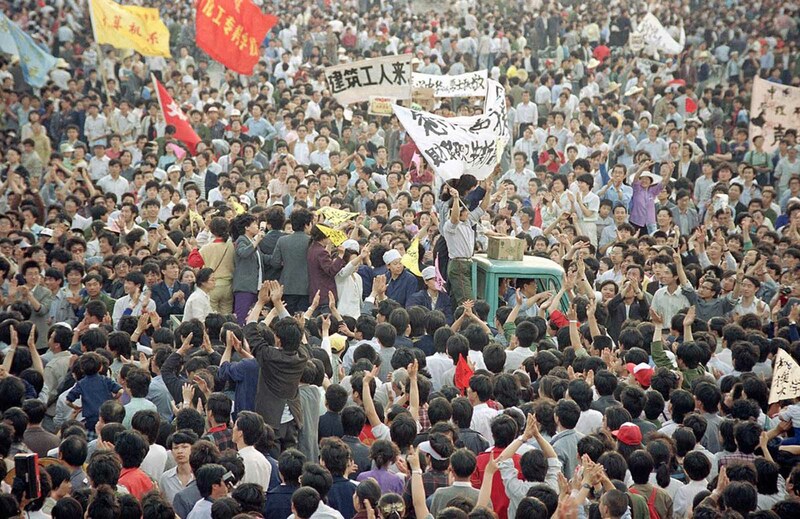 In the mid-1980s the central government had encouraged some people (notably scientists and intellectuals) to assume a more active political role, but student-led demonstrations calling for more individual rights and freedoms in late 1986 and early 1987 caused hard-liners in the government and Chinese Communist Party (CCP) to suppress what they termed “bourgeois liberalism.” One casualty of this tougher stance was Hu Yaobang, who had been the CCP general secretary since 1980 and who had encouraged democratic reforms; in January 1987 he was forced to resign his post. 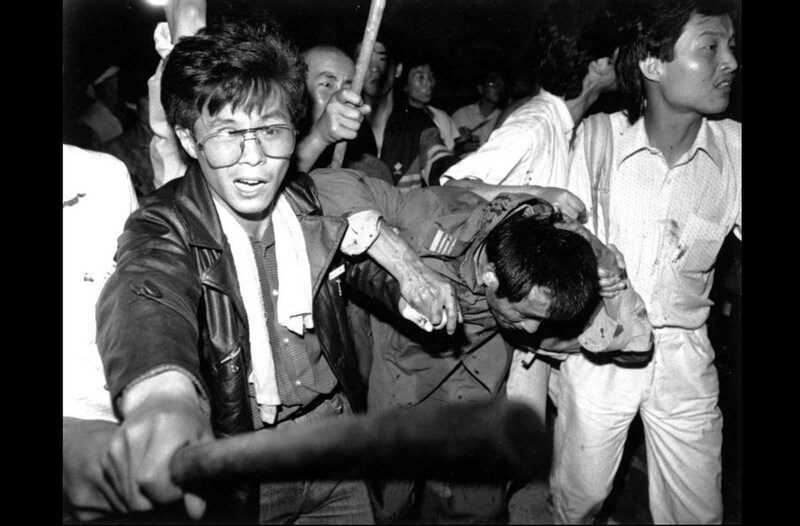 The catalyst for the chain of events in the spring of 1989 was the death of Hu in mid-April; Hu was transformed into a martyr for the cause of political liberalization. On the day of his funeral (April 22), tens of thousands of students gathered in Tiananmen Square demanding democratic and other reforms. For the next several weeks, students in crowds of varying sizes—eventually joined by a wide variety of individuals seeking political, social, and economic reforms—gathered in the square. 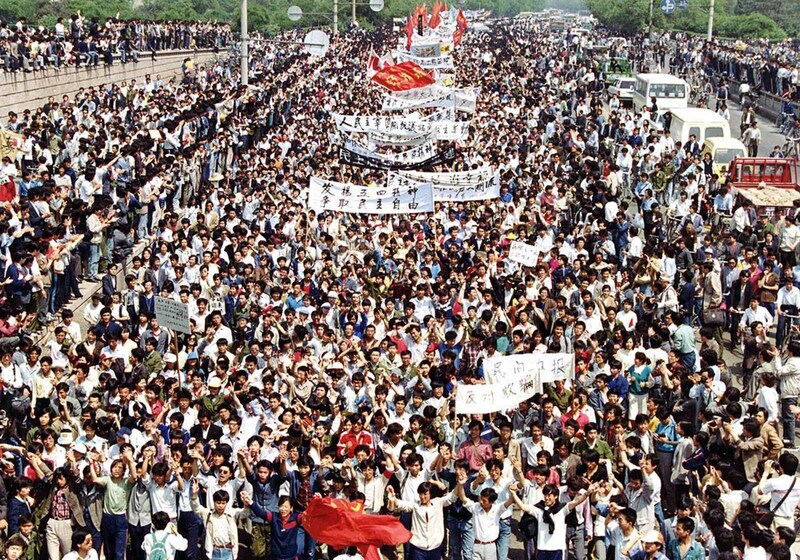 Thousands of students from local colleges and universities march to Tiananmen Square, Beijing, on May 4, 1989, to demonstrate for government reform. The initial government response was to issue stern warnings but take no action against the mounting crowds in the square. Similar demonstrations rose up in a number of other Chinese cities, notably Shanghai, Nanjing, Xi’an, Changsha, and Chengdu. However, the principal outside media coverage was in Beijing, in part because a large number of Western journalists had gathered there to report on the visit to China by Soviet leader Mikhail Gorbachev in mid-May. Shortly after his arrival, a demonstration in Tiananmen Square drew some one million participants and was widely broadcast overseas. Meanwhile, an intense debate ensued among government and party officials on how to handle the mounting protests. Moderates, such as Zhao Ziyang (Hu Yaobang’s successor as party general secretary), advocated negotiating with the demonstrators and offering concessions. However, they were overruled by hard-liners led by Chinese premier Li Peng and supported by paramount elder statesman Deng Xiaoping, who, fearing anarchy, insisted on forcibly suppressing the protests. 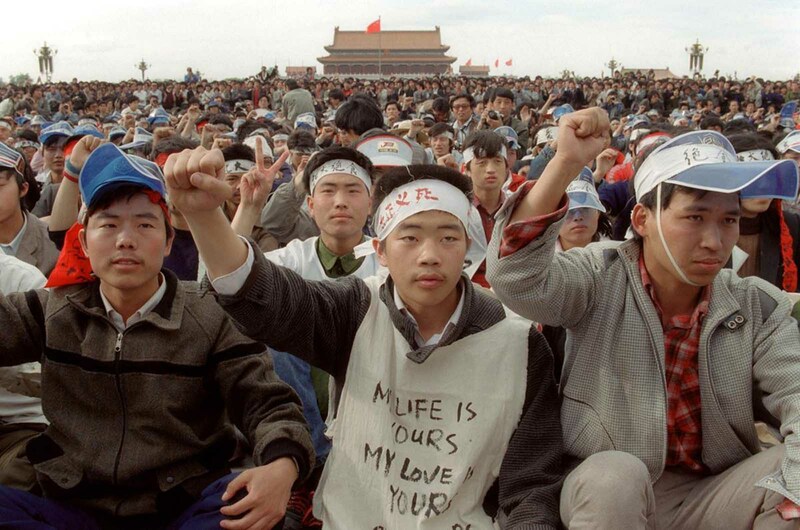 Students from Beijing University stage a huge demonstration in Tiananmen Square as they start an unlimited hunger strike as the part of mass pro-democracy protest against the Chinese government, on May 18, 1989. During the last two weeks of May, martial law was declared in Beijing, and army troops were stationed around the city. However, an attempt by the troops to reach Tiananmen Square was thwarted when Beijing citizens flooded the streets and blocked their way. 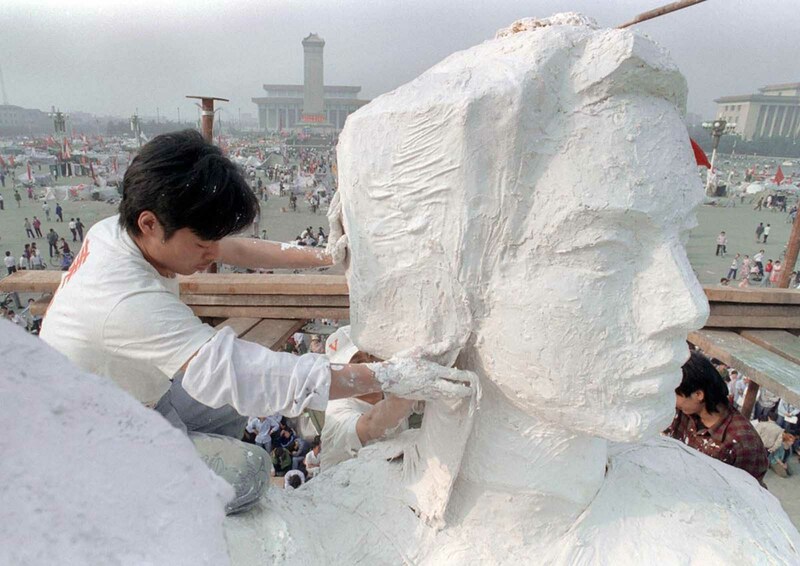 Protesters remained in large numbers in Tiananmen Square, centring themselves around a plaster statue called “Goddess of Democracy,” near the northern end of the square. Western journalists also maintained a presence there, often providing live coverage of the events. By the beginning of June, the government was ready to act again. 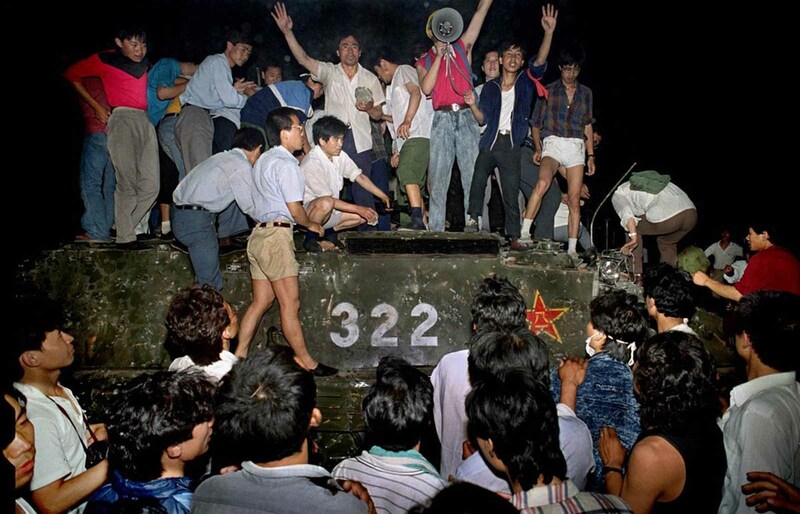 On the night of June 3–4, tanks and heavily armed troops advanced toward Tiananmen Square, opening fire on or crushing those who again tried to block their way. Once the soldiers reached the square, a number of the few thousand remaining demonstrators there chose to leave rather than face a continuation of the confrontation. 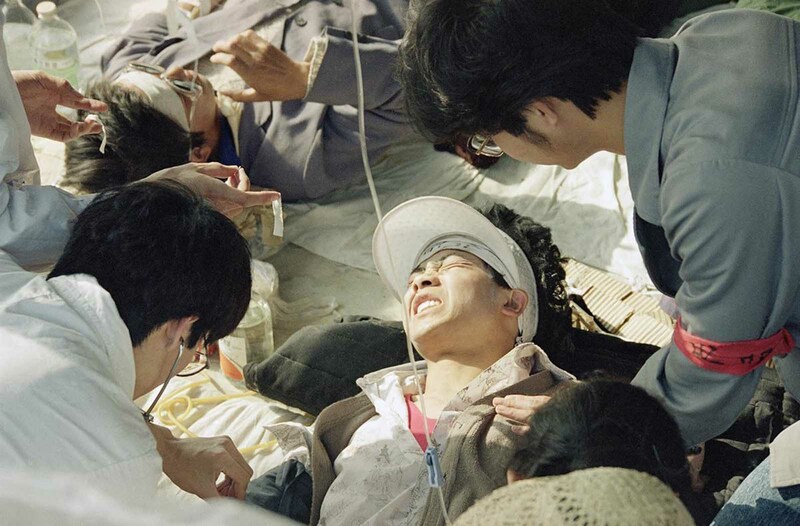 A striking Beijing University student is given first aid by medics at a field hospital in Tiananmen Square, on May 17, 1989, the fourth day of their hunger strike for democracy. By morning the area had been cleared of protesters, though sporadic shootings occurred throughout the day. The military also moved in forcibly against protesters in several other Chinese cities, including Chengdu, but in Shanghai the mayor, Zhu Rongji (later to become the premier of China), was able to negotiate a peaceful settlement. By June 5 the military had secured complete control, though during the day there was a notable, widely reported incident involving a lone protester momentarily facing down a column of tanks as it advanced on him near the square. In the aftermath of the crackdown, the United States instituted economic and diplomatic sanctions for a time, and many other foreign governments criticized China’s handling of the protesters. 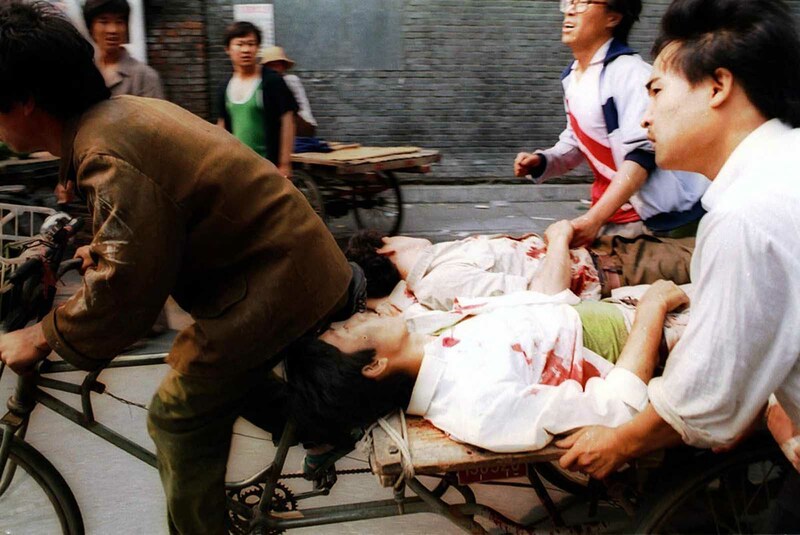 The Western media quickly labeled the events of June 3–4 a “massacre.” The Chinese government arrested thousands of suspected dissidents; many of them received prison sentences of varying lengths of time, and a number were executed. However, several dissident leaders managed to escape from China and sought refuge in the West, notably Wu’er Kaixi. The disgraced Zhao Ziyang was soon replaced as party general secretary by Jiang Zemin and put under house arrest. A truck is almost buried in people as it makes its way through the crowd of thousands gathered in Tiananmen Square in a pro-democracy rally, on May 17, 1989. From the outset of the incident, the Chinese government’s official stance was to downplay its significance, labeling the protesters “counterrevolutionaries” and minimizing the extent of the military’s actions on June 3–4. The government’s count of those killed was 241 (including soldiers), with some 7,000 wounded; most other estimates have put the death toll much higher. In the years since the incident, the government generally has attempted to suppress references to it. Public commemoration of the incident is officially banned. However, the residents of Hong Kong have held an annual vigil on the anniversary of the crackdown, even after Hong Kong reverted to Chinese administration. The suppression on June 4 marked the end of a period of relative press freedom in China, and media workers—both foreign and domestic—faced heightened restrictions and punishment in the aftermath of the crackdown. State media reports in the immediate aftermath were sympathetic to the students. As a result, those responsible were all later removed from their posts. Two news anchors Xue Fei and Du Xian, who reported this event on June 4 in the daily Xinwen Lianbo broadcast on China Central Television were fired because they displayed sad emotions. Wu Xiaoyong, the son of former foreign minister Wu Xueqian was removed from the English Program Department of Chinese Radio International, ostensibly for his sympathies towards protesters. Editors and other staff at People’s Daily, including director Qian Liren and Editor-in-Chief Tan Wenrui, were also sacked because of reports in the paper which were sympathetic towards the protesters. Several editors were arrested. 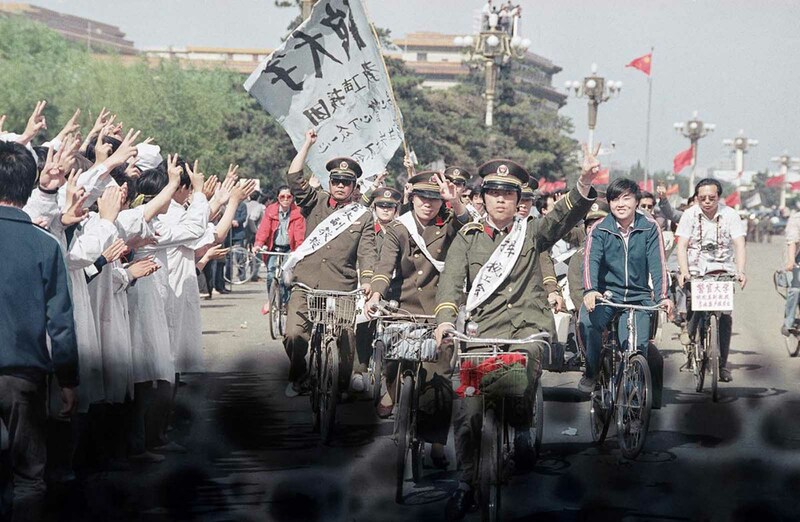 Unidentified Beijing youths chant as they drive to Tiananmen Square to lend their enthusiastic support to striking university students, on May 19, 1989. 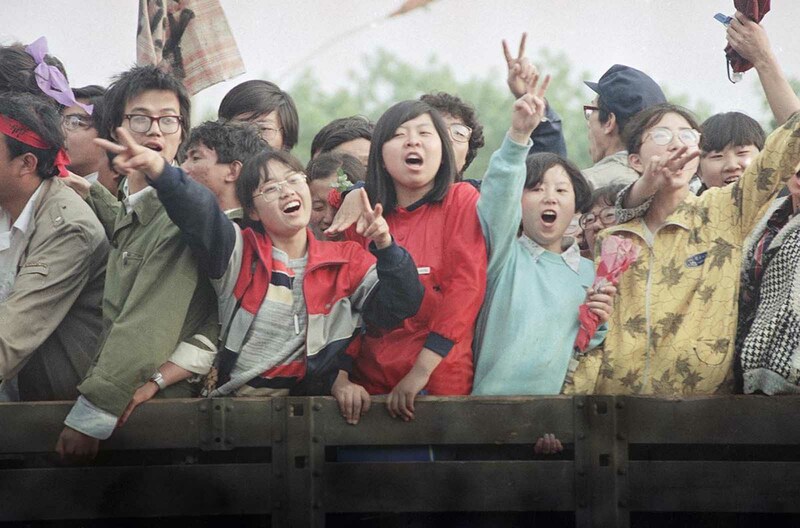 Enthusiastic demonstrators are cheered by bystanders as they arrive at Tiananmen Square to show support for the student hunger strike, on May 18, 1989. Beijing police parade through Tiananmen Square carrying banners in support of striking University students, on May 19, 1989. The students were in the sixth day of their hunger strike for political reform. 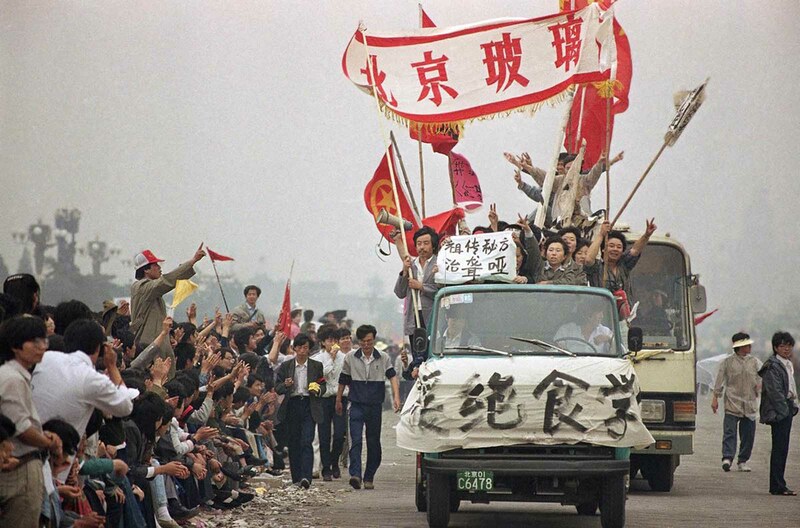 Pro-democracy demonstrators raise their fists and flash the victory sign in Beijing while stopping a military truck filled with soldiers on its way to Tiananmen Square on the day when then Prime Minister Li Peng declared Martial Law, May 20, 1989. 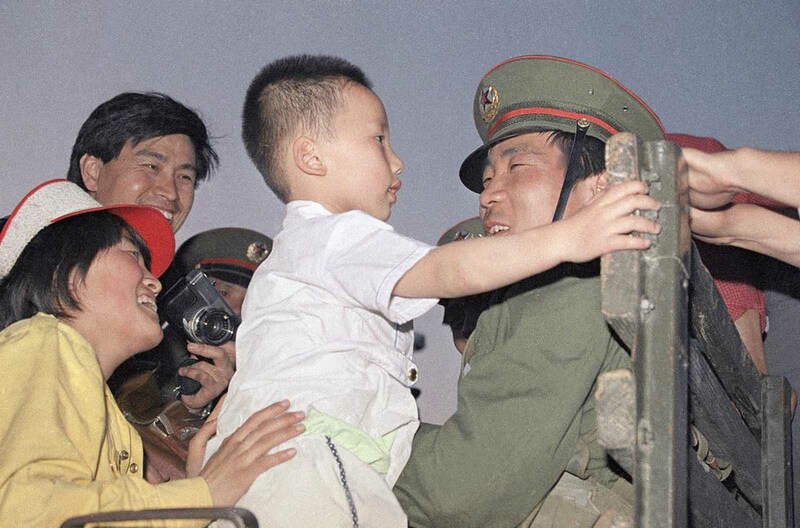 An unidentified mother introduces her son to a soldier on an army truck, 8 kilometers west of Tiananmen Square, in Beijing, on May 20, 1989. Citizens had surrounded and stopped the force. 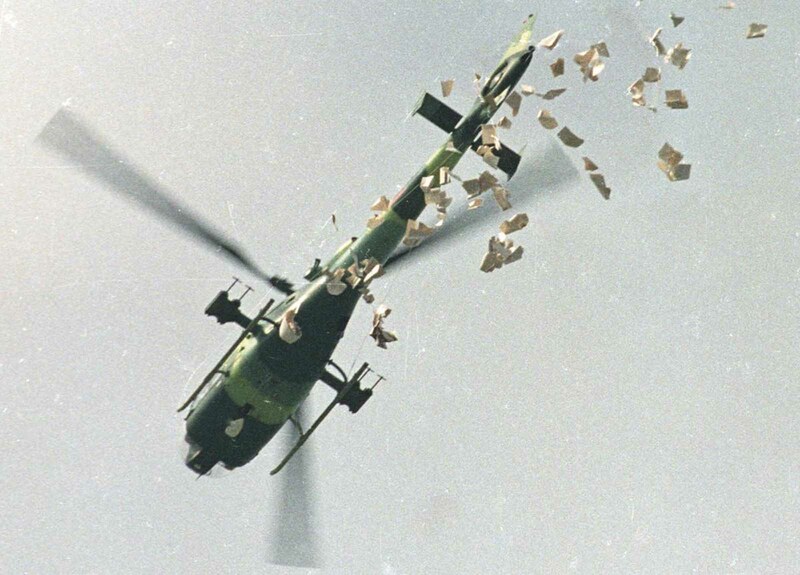 A military helicopter drops leaflets above Tiananmen Square which state that the student protesters should leave the Square as soon as possible, on May 22, 1989. 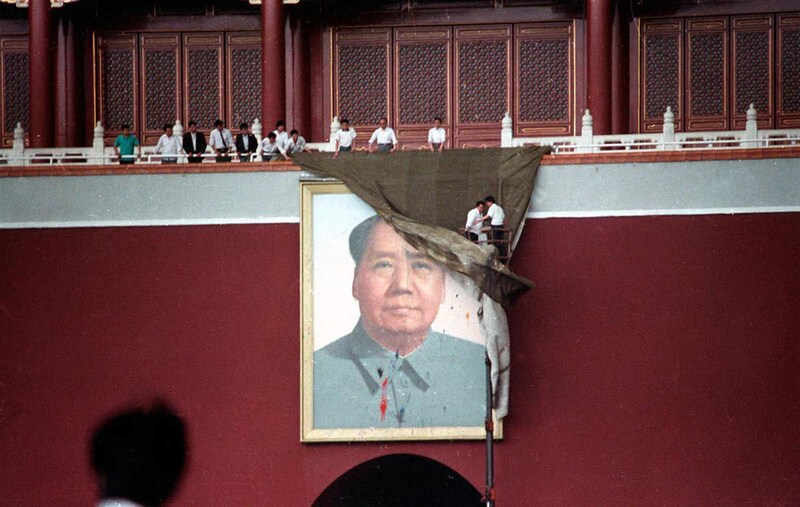 Workmen try to drape the portrait of Mao Tse-tung in Beijing’s Tiananmen Square after it was pelted with paint, on May 23, 1989. 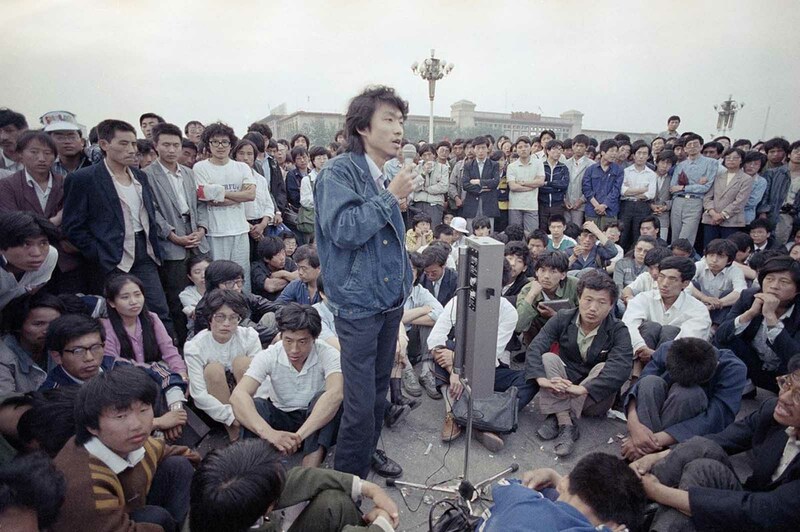 Beijing University students listen as a strike spokesman details plans for a rally in Tiananmen Square, which they have occupied for the last two weeks, on May 28, 1989. 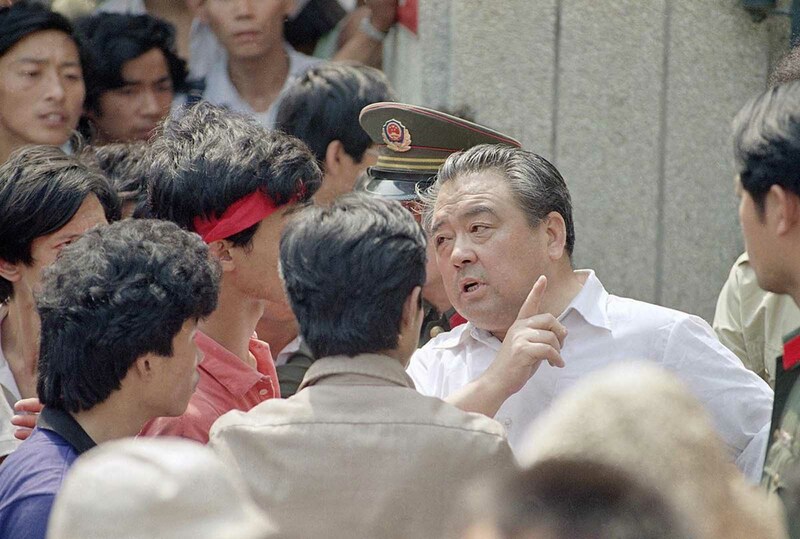 A plainclothes policeman tells students protesting in front of Beijing police headquarters that their activities violate martial law, on May 30, 1989, in Beijing. 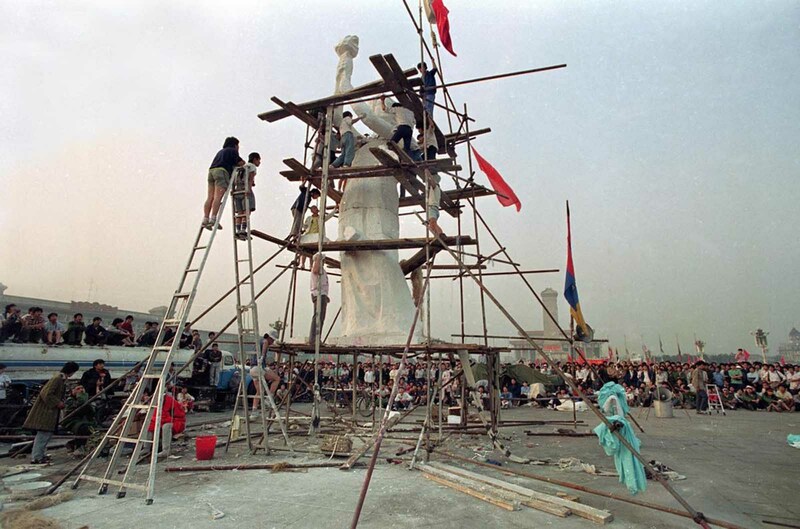 Beijing University students put the finishing touches on the Goddess of Democracy in Tiananmen Square, on May 30, 1989. 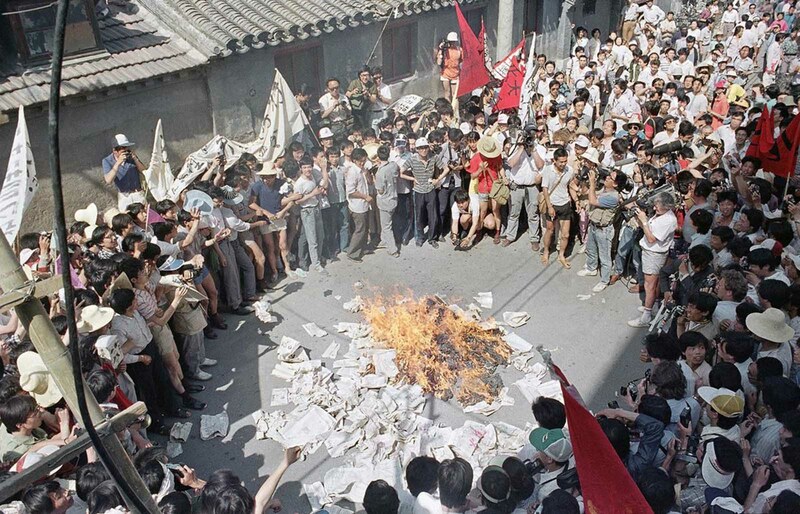 A huge crowd gathers to watch as student protestors burn copies of the Beijing Daily in retaliation for anti-student articles in front of the newspaper’s offices, on June 2, 1989. 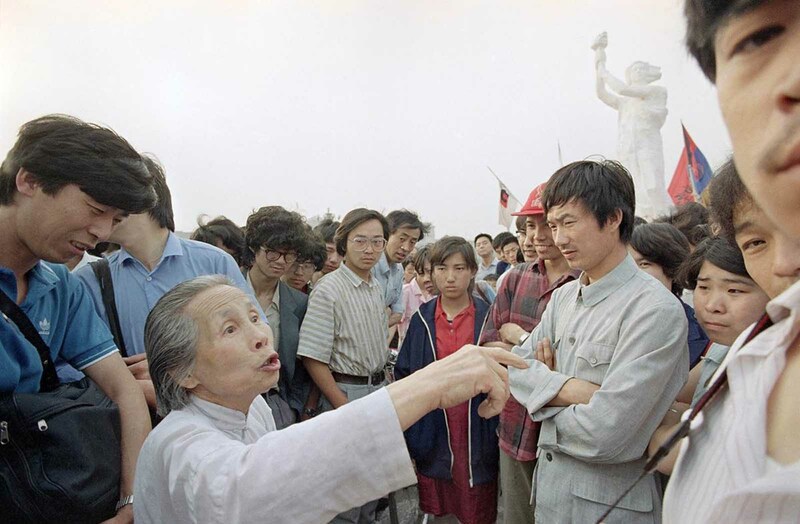 A senior citizen airs her views on democracy in a discussion with striking students, on May 31, 1989 in Tiananmen Square. 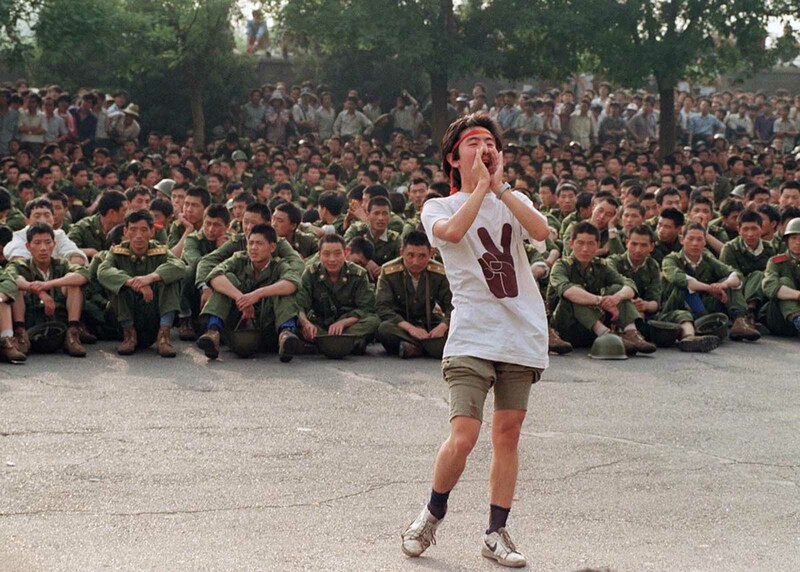 A dissident student asks soldiers to go back home as crowds flooded into the central Beijing, on June 3, 1989. 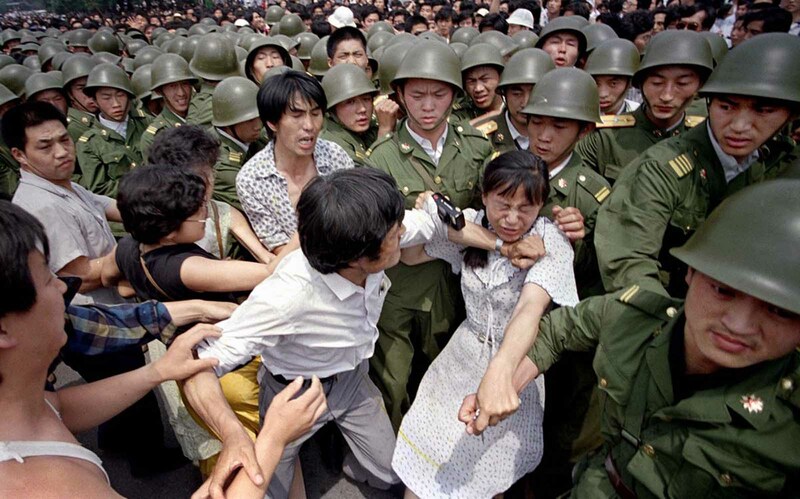 A young woman is caught between civilians and Chinese soldiers, who were trying to remove her from an assembly near the Great Hall of the People in Beijing, on June 3, 1989. 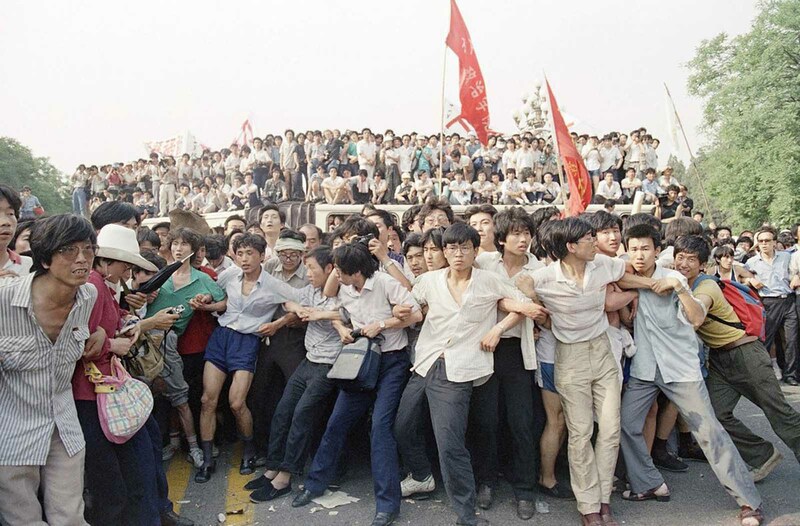 Pro-democracy protesters link arms to hold back angry crowds, preventing them from chasing a retreating group of soldiers near the Great Hall of the People, on June 3, 1989 in Beijing. Protesters were angered by an earlier attack upon students and citizens using tear gas and truncheons. 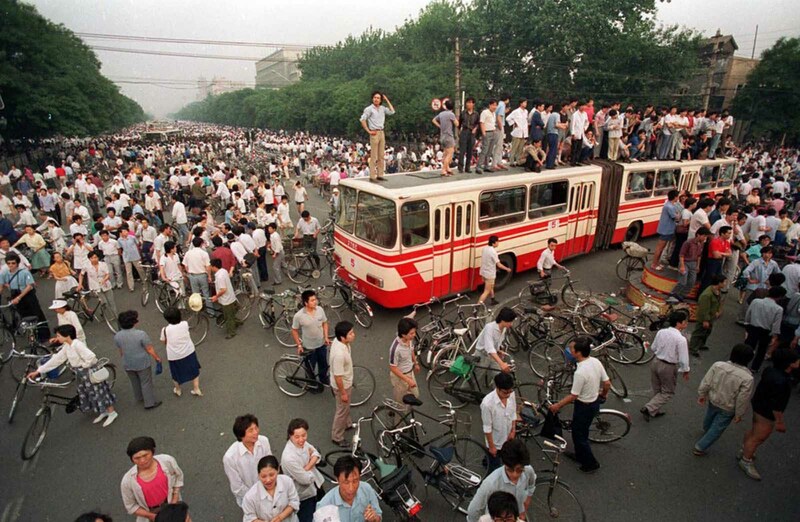 People in the background stand atop buses used as a roadblock. 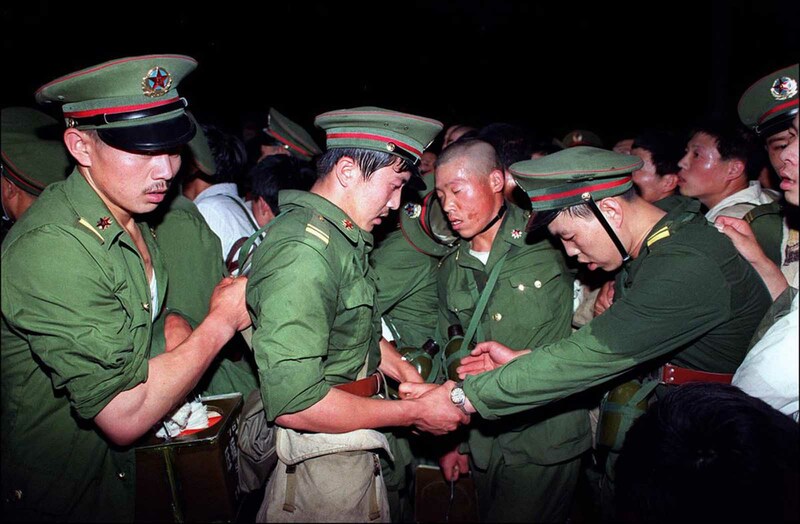 Exhausted, humiliated soldiers are hustled away by protesters in central Beijing, on June 3, 1989. 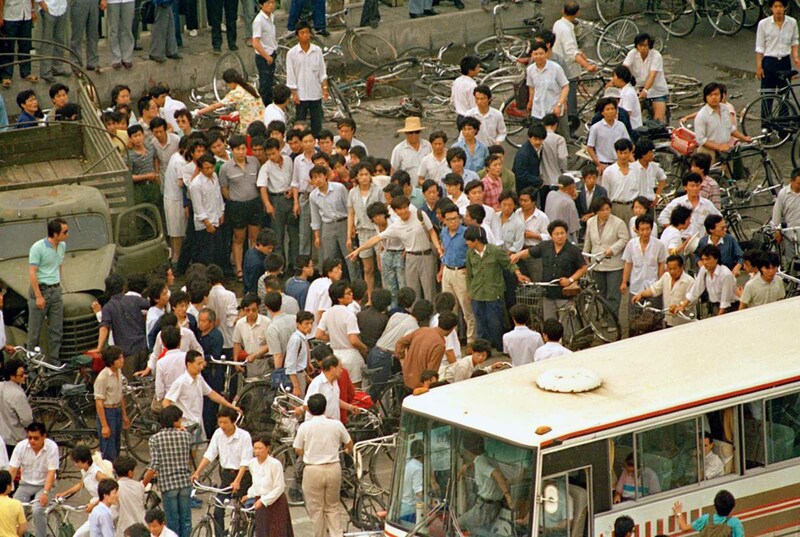 A huge crowd gathers at a Beijing intersection where residents used a bus as a roadblock to keep troops from advancing toward Tiananmen Square in this June 3, 1989 photo. 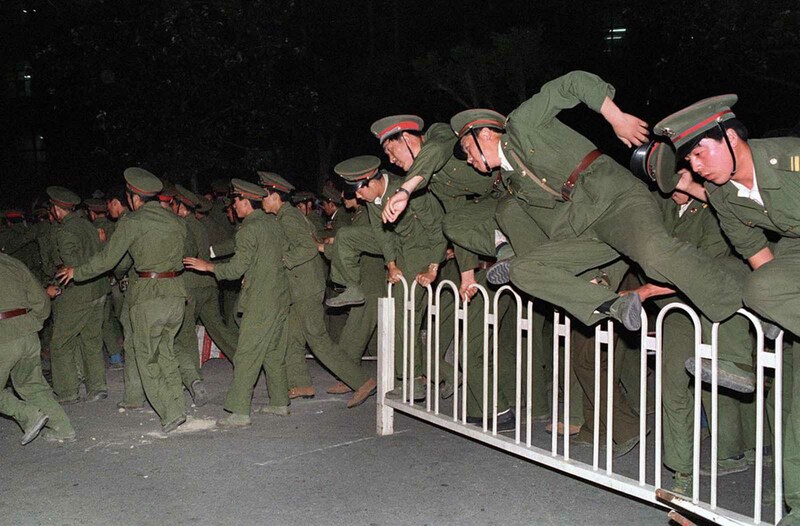 People’s Liberation Army (PLA) soldiers leap over a barrier on Tiananmen Square on June 4, 1989, during heavy clashes with people and dissident students. The PLA was reportedly under orders to clear the square by 6:00 am, with no exceptions. 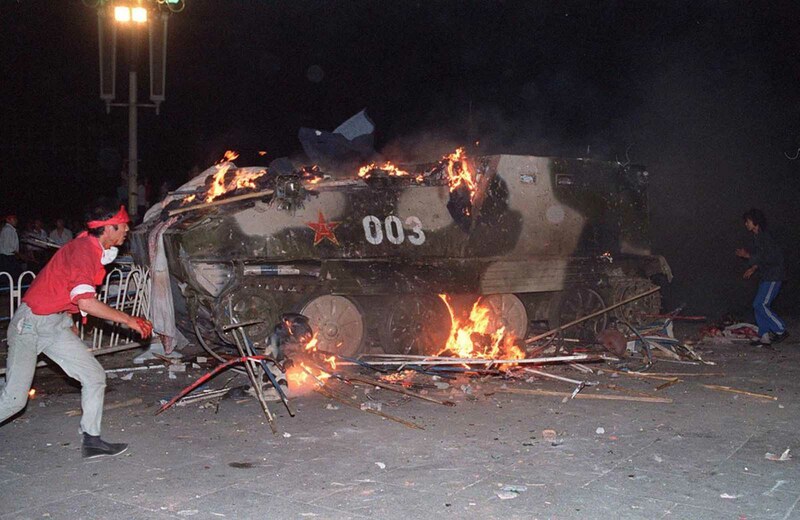 An armored personnel carrier, in flames after students set it on fire near Tiananmen Square, on June 4, 1989. 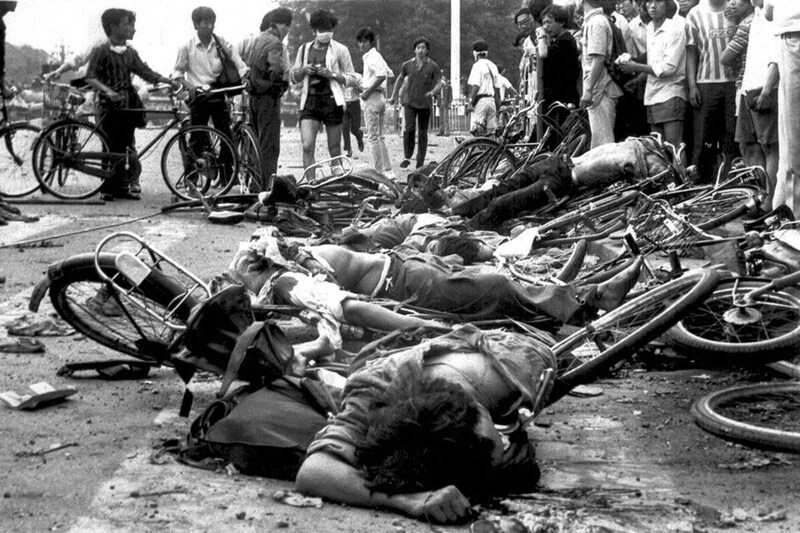 Bodies of dead civilians lie among crushed bicycles near Beijing’s Tiananmen Square, on June 4, 1989. 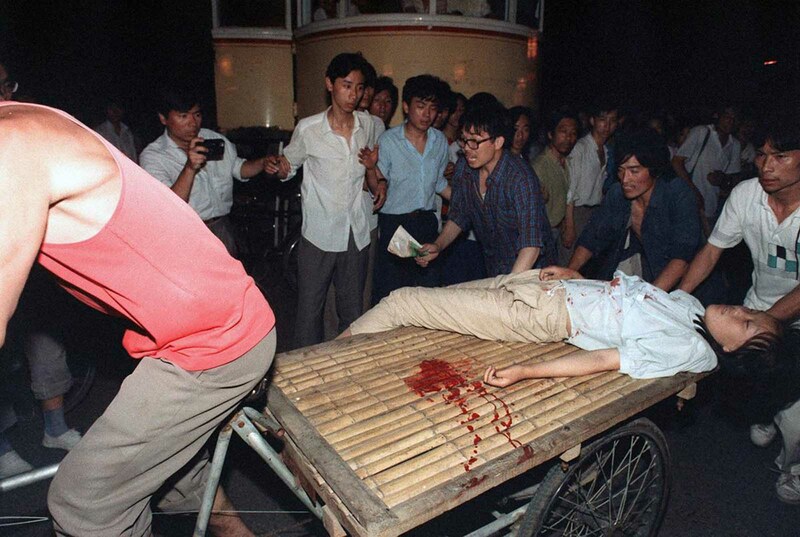 A girl wounded during the clash between the army and students near Tiananmen Square is carried out by a cart, on June 4, 1989. The driver of an armored personnel carrier that rammed through student lines, injuring many, lies dead after being beaten by students who set his vehicle on fire during an army attack on Tiananmen Square, on June 4, 1989. A captured tank driver is helped to safety by students as the crowd beats him, on June 4, 1989, in Tiananmen Square. Civilians hold rocks as they stand on a government armored vehicle near Chang’an Boulevard in Beijing, early on June 4, 1989. Violence escalated between pro-democracy protesters and Chinese troops, leaving hundreds dead overnight. 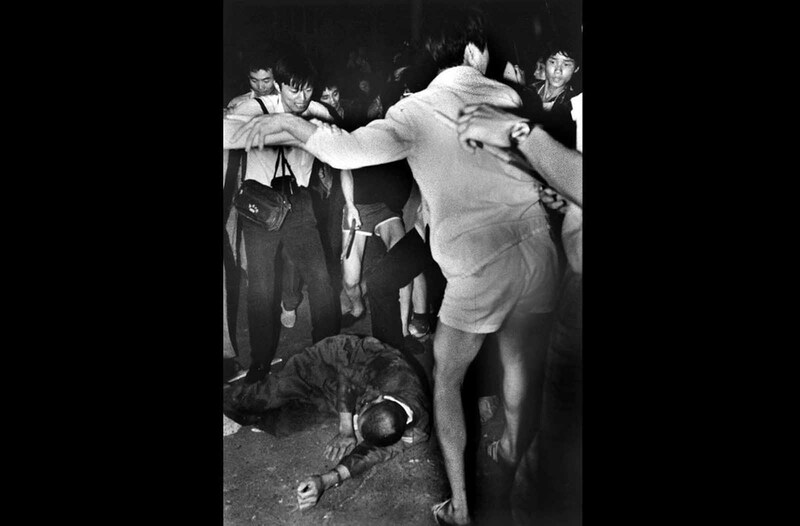 Taken care by others, an unidentified foreign journalist (2nd from right) is carried away from the clash between the army and students near Tiananmen Square, on June 4, 1989. 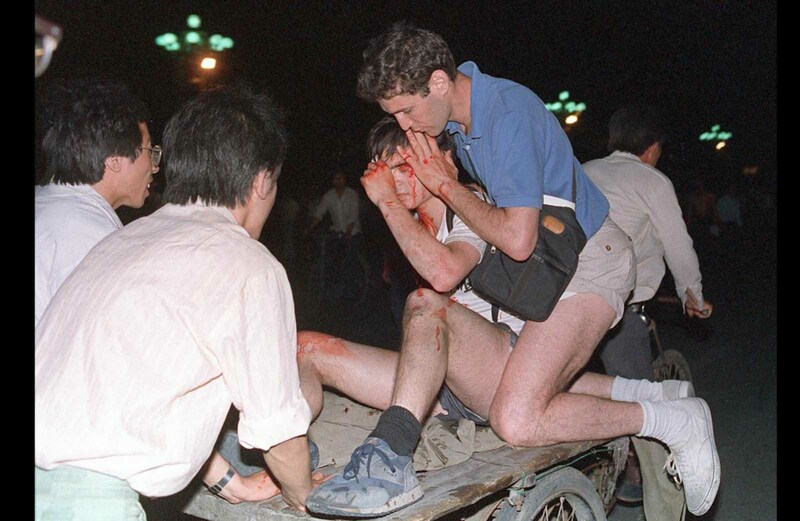 A rickshaw driver fiercely pedals wounded people to a nearby hospital, with the help of bystanders, on June 4, 1989. PLA soldiers again fired hundreds of rounds towards angry crowds gathered outside Tiananmen Square at noon. 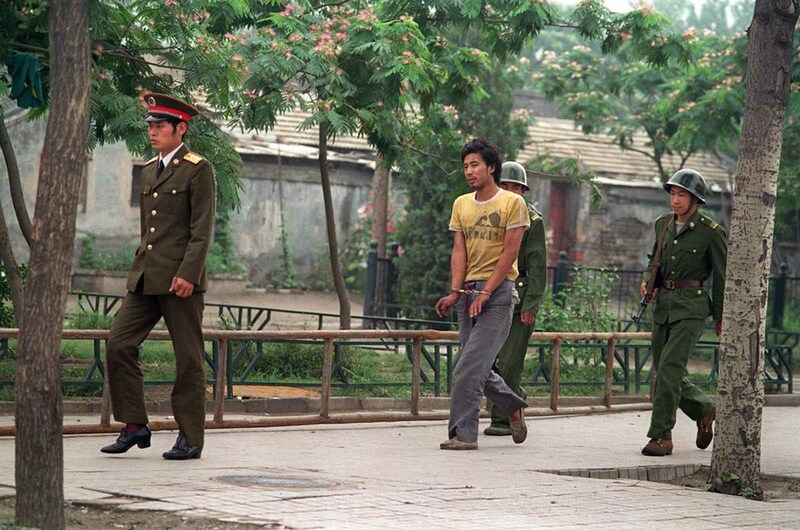 A handcuffed man is led by Chinese soldiers on a street in Beijing, in June of 1989, as police and soldiers searched for people involved in the April-June pro-democracy protests. 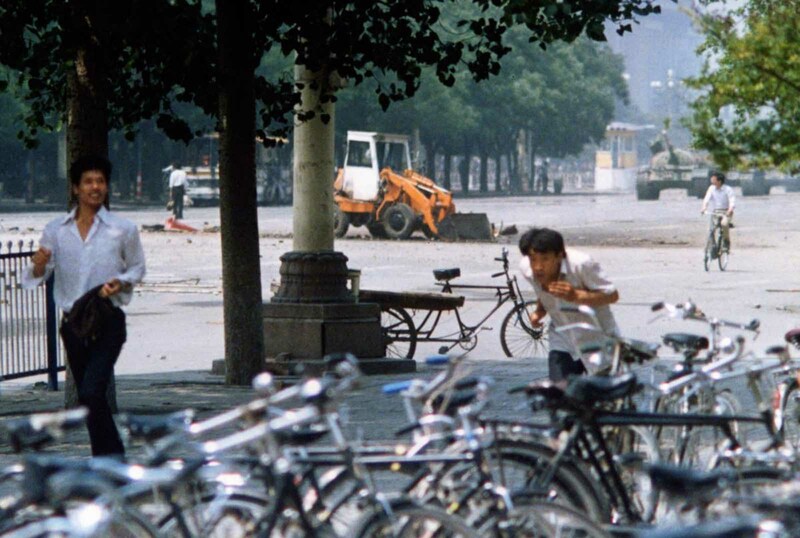 1 of 2) Three unidentified men flee as a Chinese man, background left, stands alone to block a line of approaching tanks, in Beijing’s Tiananmen Square, on June 5, 1989. The man in the background stood his ground and blocked the column of tanks when they came closer, an image captured on film by numerous other photographers and one that ultimately became a widely reproduced symbol of events there. 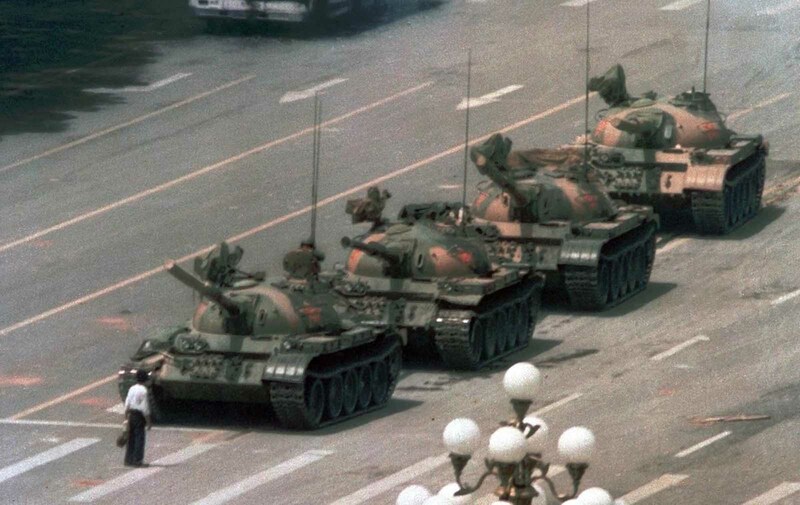 2 of 2) A citizen stands passively in front of Chinese tanks in this June 5, 1989, photo taken during the crushing of the Tiananmen Square uprising. 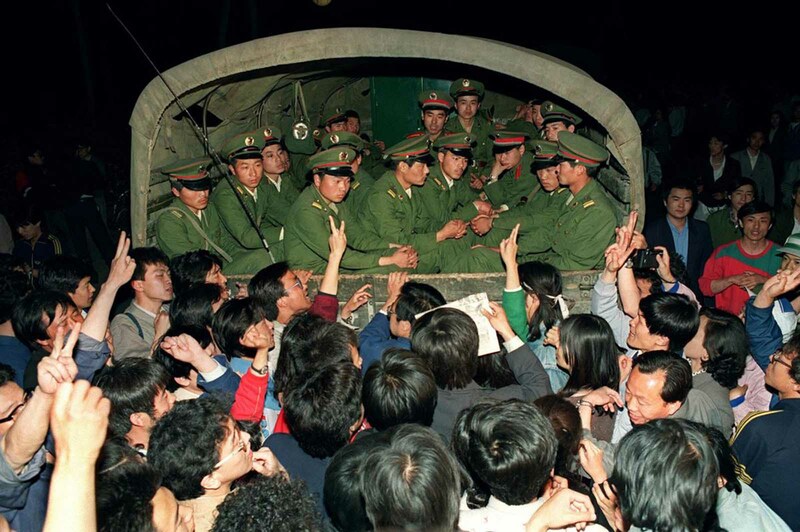 A crowd of Chinese clears a path to give a busload of foreign tourists a view of a dead body of victim of the first night of violence as People’s Liberation Army troops shot their way into Tiananmen Square to crush pro-democracy protests, on Monday morning, June 5, 1989. 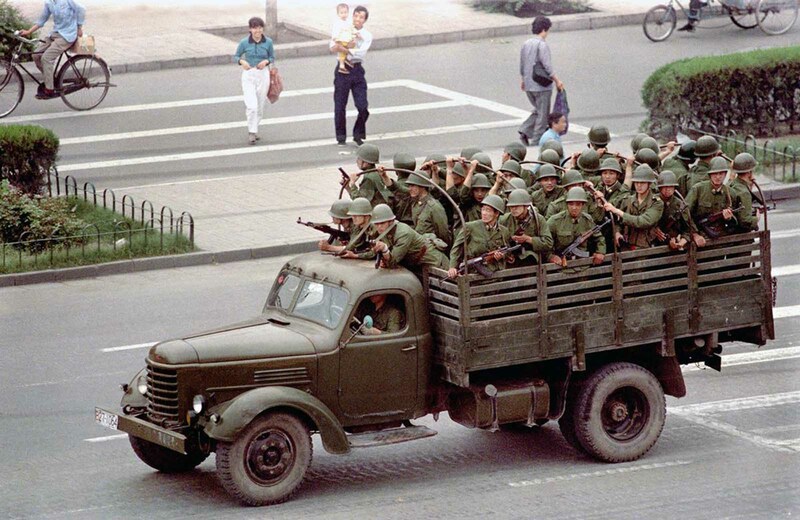 A truck drives Chinese soldiers down Chang’an Boulevard in Beijing, on June 5, 1989, one day after violence between government troops and pro-democracy protesters left hundreds dead. 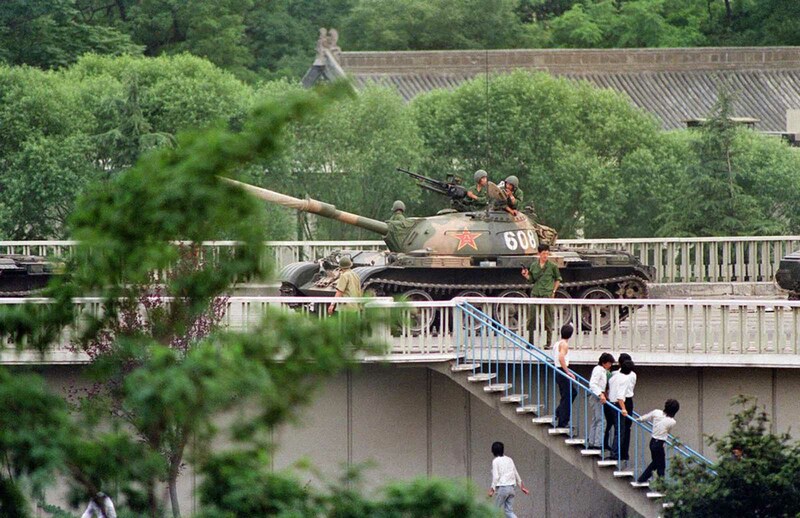 Chinese onlookers run away as a soldier threatens them with a gun on June 5, 1989 as tanks took position at Beijing’s key intersections next to the diplomatic compound. 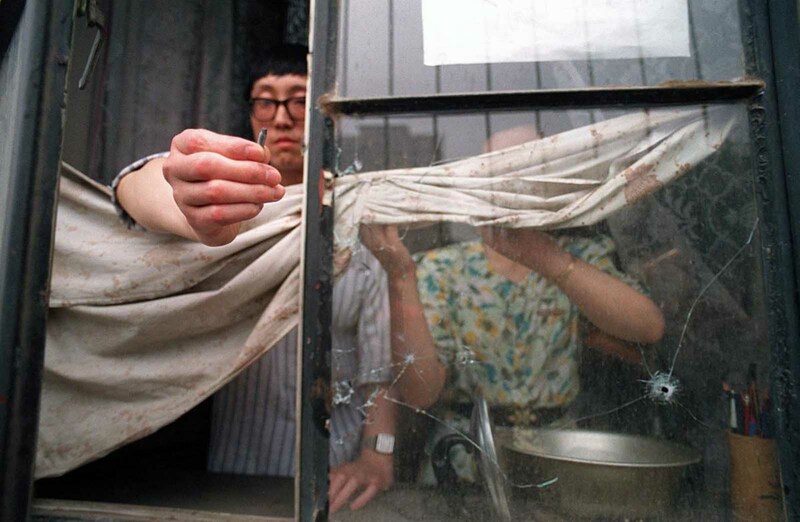 A Beijing resident on the west side of Tiananmen Square shows a slug from the automatic rifle fired by the army that went through his flat’s window in central Beijing. 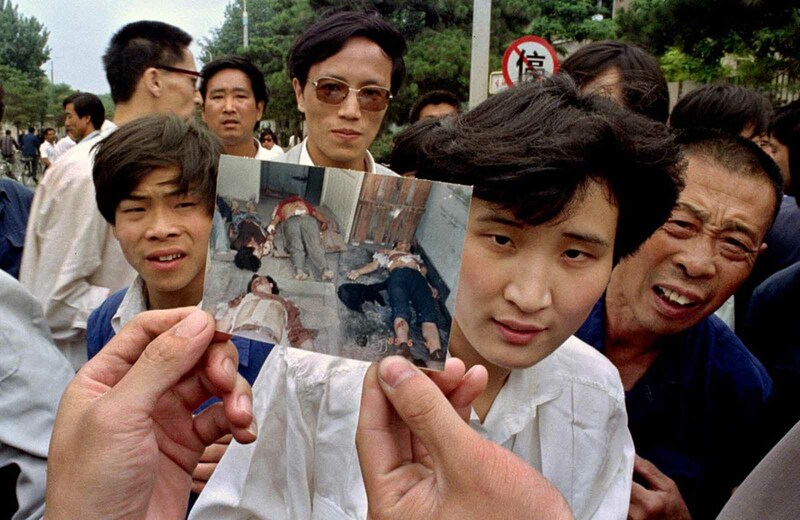 People on Chang’an Boulevard in Beijing hold up a photo that they described as dead victims of the violence against pro-democracy protesters on Tiananmen Square, on June 5, 1989. 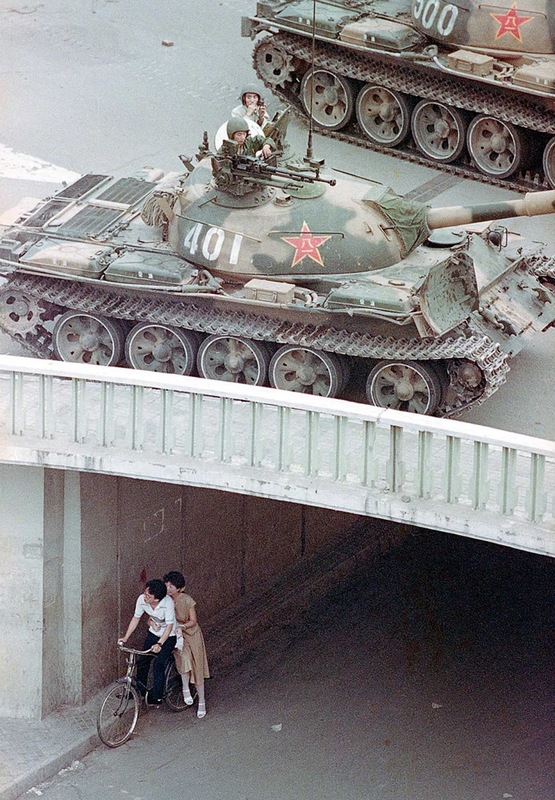 A Chinese couple on a bicycle take cover beneath an underpass as tanks deploy overhead in eastern Beijing, on June 5, 1989. 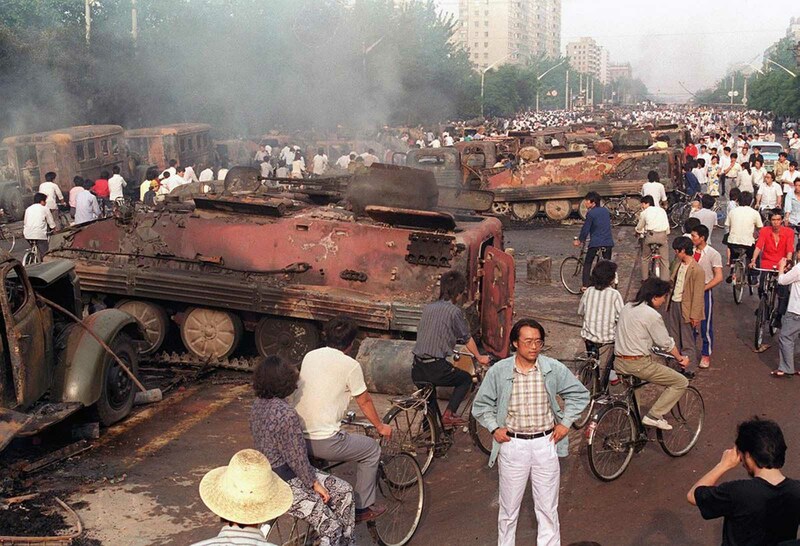 Beijing residents inspect the interior of more than 20 armored personnel carriers burned by demonstrators to prevent the troops from moving into Tiananmen Square, on June 4, 1989. 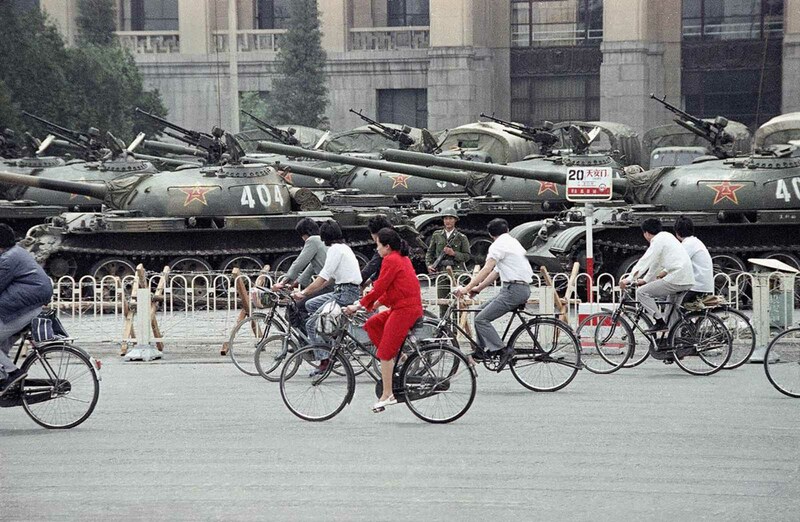 A wall of tanks and APCs greet bicycle commuters near Tiananmen Square, on June 13, 1989, in Beijing.